The general registration has not begun. Leadership for Scouting - Leadership for America Do you want to become a better leader in Scouting, and your everyday life? Do you want to know how to better organize your Pack, Troop or Crew? Do you want your youth to get a better experience from Scouting? If the answer to any of these questions is YES, you are a candidate for WOOD BADGE. 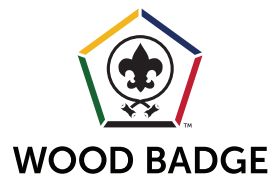 Wood Badge can help you become a better Leader, understand how to better organize your unit, and help you deliver that promise of Scouting to all Scouts, be it Cub Scouts, Boy Scouts, or Venturers. Phase I is the practical phase. That phase consist of two, 3 day weekends (5/1-5/3 & 6/6-6/7). Phase II is the application phase and lasts from the time you finish the practical phase up to 18 months. You must be present at both weekends and you will have to attend small group meetings between the weekends in order to complete Phase I. The 1st weekend begins at 7:30 am on Friday, May 1, 2020 and concludes between 5:30 - 6:00 pm on Sunday, May 3rd. The 2nd weekend begins at 7:00 am on Saturday, June 6, 2020 and concludes between 5:00 - 5:30 pm on Sunday, June 7th. You MUST attend all dates listed above to successfully complete the course. During the weekends you will be developing a series of goals that you would like to accomplish in your Scouting job during the application phase. Once you have accomplished your goals to your satisfaction and that of the assigned counselor the WOOD BADGE will be awarded. The course fee will be $300 (if paid in full on February 1, 2020) the cost will be $260). The cost includes the cost of all meals and training materials. Full Payment is encouraged at the time of registration. However; to insure a place in the course, a minimum deposit of $75 is due at time of registration. Before 2/1/2020 a discount of $40.00 will apply to all Fee ($300) Registrants. Before 2/1/2020 a discount of $40.00 will apply to all Payment of Balance if you already Paid $75 Registrants.